I have inherited 2 Walrus tents. Having used Walrus in the past, I am very excited. However, I received the tents along with a huge pile of other stuff and am not sure that I have the correct poles for the rainfly. Past experience with single-pole flys makes me guess that the pole will be a heavier pole than the tent itself. But I am not finding anything like that. So, here is the question: does anyone have any insight they can offer as to what the pole should be like? 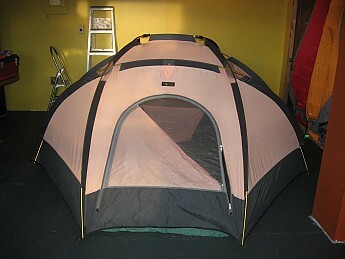 FYI - it is a 4-person Walrus dome tent. 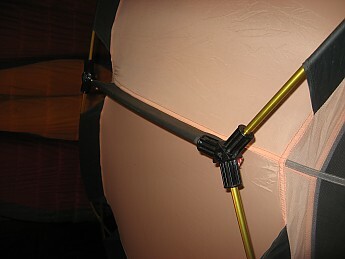 Twin-hub design, with 2 more poles (in addition to the 4 shorter length poles that are integral to the hubs) It is a bomb-proof tent, and in perfect shape....so I would really love to get this whole fly thing worked out. Thanks! I remember when the walrus trekker tarp was all the rage. they make a good product. good luck with your tent! Sorry I could not come and put it together for you but I am in Australia and have something else to do anyway. Thanks! That would have been awesome. :) We have just opened a used gear consignment shop here in Lyons, Colorado called the Gear Spot. Currently we have a pile of about 25-30 tents that we are sorting through to get everything combined properly. When the pile was given to us, it was just a jumble of tents, flys, footprints, bags, and poles. Fun, huh? 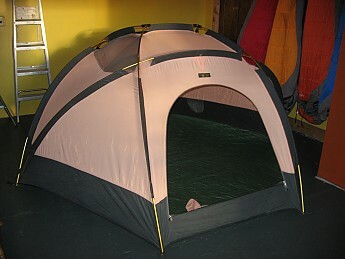 Unfortunately, it is not an ARC4......or any other Walrus tent that I can find a photo of. It seems like it was a predecessor to the ARC4 by a few years. There are 2 hubs at the top, which essentially create an "H" of poles if viewed from above. And then there are 2 additional longer poles. Here is what the assembled tent looks like. Anyone know what model it is? I think that is the Eclipse. If it is the fly should be gray with the two triangular panels next to the door in red. The Eclipse was reviewed by Backpackers magazine in 1988 (in March) , not sure if that was the year it came out.